New for DEF CON in 2015: Because we are in new hotels we have new options for you to throw a party or hold a small event! 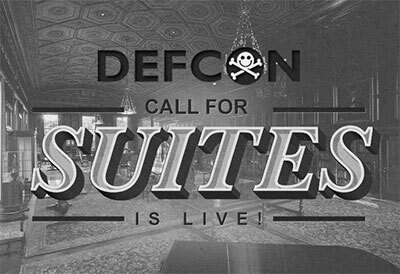 Enter the DEF CON 23 Call for Suites! Come up with a cool concept, event, or party that will be open to all attendees from Thursday to Sunday and if you are selected DEF CON will release to you or your group one of the suites at a cost of $500 per night - so $2,000 for the con. They usually go for $1,500 to $2,000 per night. The suites are approximately 2,356 - 3400 sq feet, and no, you can't remove all of the furniture unless you want to pay the hotel to move it in and out. All food and beverage, electrical, etc. you would coordinate with the hotel directly. That means your suite will be able to hold about 100 - 125 people at any given time. You can sleep in the suites two bedrooms, but we are looking for them to operate well into the night to give attendees options to hang out and meet new people and get exposed to new ideas. Pretty much anything is possible - Mystery Challenge recovery suite? Movie lounge of hacker movies? Software hack-a-thon? - Anything we forgot to ask!